Our own investigation reveals strong evidence that Venture is the manufacturer of a leading consumer device, which has potential revenue in excess of S$2.5b per year. A production ramp-up in 2017 to meet rising demand in Asia and Europe will likely continue into 2018. A launch of the device in the US will push production to full capacity, with earnings likely exceeding consensus estimate in 2018. Maintain BUY and raise target price to S$31.88, based on 19x 2018F PE. Manufacturer of a leading consumer device. Our findings without input from management reveal strong evidence that Venture is the manufacturer of a consumer device (Device I) for an American multinational company (the client). With strong demand for the device in Japan and South Korea as well as a likely production ramp-up for a highly anticipated US launch in 1H18 post FDA approval, Venture is likely to benefit. Revenue potential in excess of S$2.5b from Device I.
Cross-referencing various public sources and discussions with industry players, we estimate the revenue potential from Device I at full capacity to be in excess of S$2.5b per year. We estimate Venture was producing at less than 50% of its annual capacity as of 9M17. Production ramp-up could see another jump in 4Q17 revenue. Our channel checks reveal that Venture’s dedicated supplier for components of Device I ramped up production in 3Q17 to the same level as 1H17. With the supplier’s earnings leading by 1- 2 quarters, it is possible that Venture could see another jump in 4Q17 revenue on the back of this production ramp-up. Scenario analysis points to 2018 net profit to exceed consensus estimate on full capacity ramp-up. Should Venture reach 100% production capacity in 2018, net profit will easily surpass consensus estimate of S$385m in 2018. Anecdotal evidence suggests this to be likely as the client is already in talks with other suppliers to increase their production capacities. On a valuation based on its long-term mean 1-year forward PE of 14.1x, Venture will easily be worth over S$33/share if this pans out. Upgrading 2017-19 earnings estimates by 23-33%. Our production estimates for Device I, and a production ramp-up to at least 65% of Venture’s contracted capacity (2017: < 50%), lifts our 2017-19 net profit forecasts by 23-33%. This does not factor in contributions from a full US roll-out. Maintain BUY with a higher target price of S$31.88. The earnings ramp-up from Venture is only midway, with global take-up likely to drive it higher. Maintain BUY with a higher target price of S$31.88, based on 19x 2018F PE. Venture a key manufacturer of a leading consumer device. We have strong evidence to believe that Venture is the manufacturer of a consumer device (Device I) for an American multinational company (the client). Based on a publicly available scientific dossier submitted by the client to the European Union, it points to Technocom Systems Sdn Bhd, Venture’s wholly-owned Malaysian subsidiary, as the manufacturer. Further investigations revealed other documents that confirm Venture as manufacturer for Device I. Note that this has not been confirmed by Venture’s management, and is purely based on our own research findings. Stronger-than-expected market response drove higher production orders for Device I. According to our sources, Venture first secured the contract in 2015. Production was initially on a small scale at about 1m units per year. This changed in 2016, when the Client redoubled its efforts in Japan, and grew its market share from < 1% in early-15 to 16.3% as of Jan 18. So successful were their efforts that sales of Device I had to be limited in 2H17 while the Client increased production. Implied production of the device (through Venture) skyrocketed to 4m-5m devices in 2016, and at least 16m-17m units in 2017. Capacity ramp-up likely to continue into 2018. The production ramp-up that started in 2Q17 is likely to continue into 2018, with 4Q17 potentially reflecting another step-up in production. This is driven by the client’s need to meet faster-than-expected demand growth in its Asian markets (Japan, Korea) as well as the highly-anticipated launch of Device I in the US in 1H18. The US launch represents a market potential of some 55m individuals on top of the > 200m potential customers in 38 markets worldwide that the client requires Venture to supply devices to. One of two contract manufacturers, revenue potential in excess of S$2.5b. Venture is not alone in this global rollout of Device I, evidenced by the client’s remark of “increasing contribution of devices from (our) second supplier” during its 3Q17 presentation. This is likely a reference to Venture and its share of the production order is estimated in excess of 30m units p.a. This represents revenue potential from Device I in excess of S$2.5b, which we will touch upon later. The order size of Device I is driving 2017 earnings. At face value, the small price tag of Device I does not strike as a key revenue driver. A single Device I retails for about ¥10,980 (S$135), as compared to the US$850,000 to US$950,000 price tag for Illumina’s Novaseq machines. The key differentiator is the order size: in 1H17, orders for Device I was roughly 7m units for delivery within the year, vs the 200-odd units for Illumina to be recognised over 3-5 years. This would make Device I the key earnings driver for Venture. Estimating the units sold for Device I. Through accounts of a key supplier (Supplier X) and various public sources, we have been able to indirectly determine the quantity produced for Device I from 2015 to 1H17. Supplier X is an Asia-based firm that builds plastic components for Device I, and specifically supplies to Venture. According to its contractual agreement, it is required to sell the components directly to Venture, which as the end manufacturer assembles the components into the finished product. The full manufacturing cost is then charged to the client. With zero contribution from Venture in 2014 and Client P making up the bulk of revenue, we can safely derive the ASP for Product P (Client P’s product) using the 2014 figure for units sold (B). This translates to S$137 per unit. Then, assuming that the S$137 ASP held constant over 2015-1H17, we can derive the implied number of units sold p.a. for Product P. The difference between the total and our derived Product P figures gives us an implied number of units sold for Device I. We assume here that the figures reflect one set of components for Device I: our conversation with sources on the calculation methodology suggests this should be the case. As a sanity check, we divide revenue Supplier X recognised from Venture against the implied units sold for Device I. Doing so yields a consistent ASP of ~S$19 per unit which suggests that our estimates are reasonable. Estimating manufacturing cost for Device I. This is the tricky part. In Japan, Device I is sold at ¥10,980 (S$135). An introductory discount to customers reduces the price to ~¥7,500 (S$92), according to various websites, blogs and our ground checks. Given the client’s remark of making “negative yield on the device owing to introductory discounts”, the manufacturing costs should be between those two figures. Our best estimate of the device cost lies between S$90 and S$100 per unit. We shave 10% off from this for logistics and miscellaneous costs. At the end, we arrive at an estimated cost of S$80- 90 per unit. Device I made up 33% of 1H17 revenue. We broadly estimate Device I to have contributed S$621m, or 33%, to Venture’s 1H17 total revenue. Doing the same for 2015-16, we find the figures similar to the growth profile seen in the “Test & Measure/Medical/ Others” segment. 9M17 figures suggest a production ramp-up in 3Q17. Using the same methodology, 9M17 figures suggest that production of Device I components jumped from ~7m units in 1H17 to 13m-14m units in 9M17. This implies production of 6m-7m units in 3Q17, comparable to the whole of 1H17. We believe this to be a leading indicator (by 1-2 quarters) for Venture’s results, and look for a sharp jump in revenue in 4Q17-1Q18 as confirmation. Potential for revenue contribution to double from 2017. On our estimates, production may reach at least 16m-17m units in 2017. This might be an underestimate, especially if there was a production ramp-up in 4Q17. Even on 17m units, this is still less than 50% of Venture’s total contracted capacity. In short, there is potential for revenue to double from this juncture if our thesis pans out. At maximum production capacity, the estimated revenue potential from Device I alone is in excess of S$2.5b, assuming our S$80-90 per unit manufacturing cost. Key conclusions: Material upgrade to earnings highly likely. While several assumptions have been made that could affect these estimates, one thing is clear: a production ramp-up is underway, and Venture could see further earnings upside than what consensus is expecting. Our channel checks with industry players reveal that a third supplier may be in the works, implying that the client already anticipates its existing two suppliers to reach maximum production capacity soon. The tricky issue on gross margins. Our discussions with industry players suggest a healthy gross margin, which is reflected in Venture’s quarterly results. We find it slightly mind-boggling that Venture charges a margin on the components it procures and assembles for Device I, especially after Supplier X already makes a substantial gross margin selling to Venture. Logically, if Venture builds in a margin only on its value add, gross margin would have shrunk. However, this does not appear to be the case as quarterly results since 1Q15 have seen gross margin rise from 23.9% in 1Q15 to 24.6% in 3Q17. Alternatively, it could be possible Venture is charging a hefty margin on its value add, which is starting to be reflected in the results as contributions from Device I grow. Headline net margin expected to flatten out at 3Q17 levels. As of 3Q17, headline net margin stood at 10.5%, but excluding a S$13m inventory write-off, core margin was closer to 11.7%. We expect headline net margins to stay at 3Q17 levels going forward as it would not be wise to give clients cause for cost downs. As such, Venture’s actual profitability should be considered from its core net margin going forward as Device I adds to the bottom line. Pick-up in Asian and European markets to drive production ramp-up. As of 4Q17, the client has successfully converted 4.7m users to Device I. Based on figures from World Bank, this represents less than 5% of the addressable market in countries where the product has been launched. With take-up rates accelerating, the client will have to ramp up production capacity to meet demand. Based on figures from World Bank, the addressable market in countries it has launched stands at ~190m users. Assuming an eventual 30% market share, and that our ground checks showing users were encouraged to purchase two devices each, this translates to total demand of over 100m units of Device I, well over the production capacity of both Venture and its compatriot manufacturer. US FDA approval for device launch in 2018 an earnings catalyst. At this juncture, we have not factored in a production ramp-up for its impending launch in the US. It is possible that part of the 2017 ramp-up was in preparation for the US launch on top of meeting demand in its Asian markets. Additionally, the gradual take-up rates in European cities will likely dictate the client to ramp up production only on evidence of a strong takeup rate of Device I. Taking into consideration that the US market represents a potential 50m-55m units, this would easily push Venture into full capacity and drive an earnings rerating. Upgrade 2017-19 earnings estimates by 23-33%. Based on our production estimates for Device I and a production ramp-up to at least 65% of Venture’s contracted capacity (2017: < 50%), we upgrade our 2017-19 net profit estimates by 23-33% to S$371m (+25%), S$475m (+33%) and S$492m (+23%) respectively. Our 2019 forecast is low as we have not factored in any contribution from a full US roll-out. That will easily tip Venture into full capacity and potentially put 2018 net profit at > S$600m. Potential special dividend for 2017’s stellar earnings. 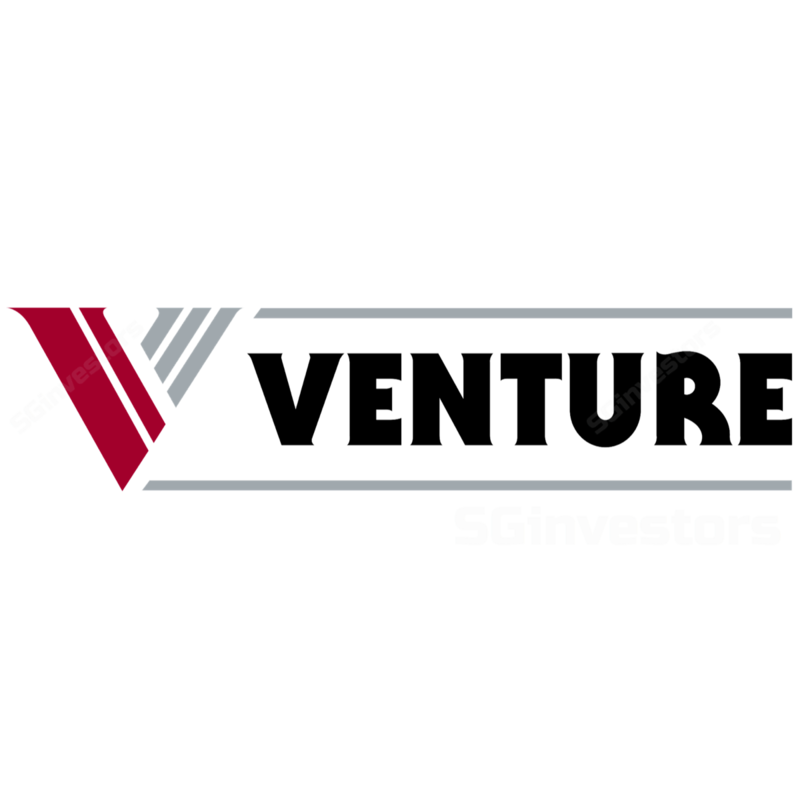 Venture has historically paid a prudent first and final 50 S cents dividend over the last five years. Given the cyclical nature of its business, we think management will opt to pay a special dividend on top of the final dividend in lieu of the outstanding 2017 results. We estimate the special dividend to be 15-20 S cents, translating to a total payout of 65-70 S cents. Benchmarking valuation to 19x 2018F PE. We peg our target price at 19x 2018F PE, close to that for US-listed peers Plexus Corp (18.2x) and Benchmark Electronics (17.6x). This represents 1SD above Venture’s long-term mean PE of 14.1x, and a 17% premium over the implied PE (16.2x, 2018F ROE: 20.4%) based on a P/B-ROE regression of Venture’s historical valuations. We opine this to be fair, given that it is already generating above-average returns against its US peers. Maintain BUY and upgrade target price to S$31.88. Our target price of S$31.88 is based on 19x 2018F PE. We re-iterate that this excludes contributions from a production ramp-up driven by a US launch this year. Should this pan out, our target price will easily exceed S$33 just on its long-term mean PE of 14.1x. Key risks: Device launch in US fails to materialise. The device is subject to application approval from the US Food and Drug Administration (FDA), which is expected in end1Q18. There are already some worries, given the negative review by a scientific committee advising the FDA in early-Feb 18. However, this pertains to the ability of the client to market Device I as a reduced risk product (RRP) and the committee’s decision may influence but does not dictate the outcome. Expectations are for the client to secure FDA approval to at least launch the product in the US this year. If the client fails to receive approval, this might delay the production ramp-up that will provide the next leg of earnings growth for Venture. Device I, while innovative, has sparked plenty of debate among governments. The acceleration in demand in the client’s European markets was a reflection of better understanding by the governments and relaxing of legislative rules regarding sales of the device. However, given the controversy surrounding the product, this could easily change again to discourage its sale. This will negatively impact demand for the device and hence production orders.